Ygartua’s Eclectic Universe will you give you an opportunity to immerse yourself in the eclectic and multifaceted world of artist Paul Ygartua–to learn about the different techniques and the various styles experienced by the artist throughout his work. He is complex in his imagination and his expression as is quite evident by the many styles and techniques that he has mastered and progressed over the last 40 years. A brief description of the art of Ygartua is virtually impossible. A visionary with an acute sensual perception and a facility to express these dramatic emotions with a spontaneity that brings life and emotion to the subject. This takes on many forms and many directions. 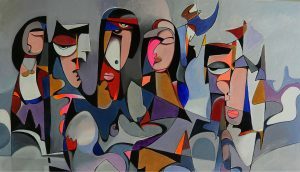 So to fill the needs of his deep and expressive imagination, he utilizes many techniques and styles. Some need fast spontaneous physical expression, other forms need more time and yet still capture the impulsive character of Ygartua. The complexity and the individuality that is expressed throughout his works accounts for his constant change of city and country – being inspired by the world and the people around him.